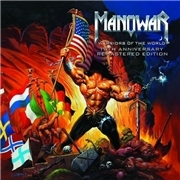 MANOWAR has been around since the dawn of time, or at least since 1980. Pretty little has changed though members have come and gone. From humble beginnings the core duo of bassist Joey de Maio and guitarist Ross the Boss met during BLACK SABBATH´s Heaven & Hell Tour. They soon hooked up with singer Eric Adams and on drums they started out with THE RODS man Carl Canedy. The latter soon to be replaced by Donnie Hamzik, due to other obligations probably. Hamzik soon left and was in turn replaced by the not completely unknown Scott Columbus, who passed away in 2011 at 54. Since then there have been contracts signed in blood, ridicules like MANOSMURF, hordes of fans and good album sales. This is almost the same release as in 2002. The sound has been boosted of cause, but the only addition is a live version of “House of Death” recorded live in Birmingham. Personally I must say I did find the title track a bit too sing-along friendly back in the day. There is still the pomp, the caressing vocals, the gentle piano parts, the opera (“Nessum Dorma”), the choirs, the speed, and the epic that you either love or hate. In short you either love them…or laugh. Nothing´s changed since the eighties, as I said. But in 2013 I really like the title track, “Hand of Doom” and, of cause, the contagious and utterly excellent “House of Death”. But I am also flabbergasted at the sheer ridiculousness of “An American Trilogy” and “The March”. Would I recommend it? Well the sound is better, the strong sides are there and if you can muster their “hey-ho to battle we go” there is certainly still something for most metal heads here. There are no real low points, but there are something unusual in my notes…question marks.